Whenever one of these comes in the mail, there’s a scurrying to the couch, followed by an in-depth perusal of each page, punctuated by discussions of which outfits or accessories are new. Sometimes I think our girls derive more fun from looking through the catalog and dreaming of what they might choose if given the opportunity than they would get from receiving the actual products. In fact, I remember going through this same process as a child, back in the days when Sears and JCPenney still mailed mammoth Christmas catalogs to our home. It’s a simple pleasure – one that costs nothing, but brings great delight and hours of entertainment. Have your children enjoyed any simple pleasures lately? We just got one of these catalogs in the mail, too, and my older daughter (aged 5) loves looking at it. She doesn't realize that we can actually order these things, and I don't tell her! She just enjoys looking at the fun dolls and their clothes. And I remember dreaming through the Sears and Penney's catalogs, too. What fun we had! This just came yesterday….haven't shown it to my dear daughter yet…but I can hear the gasps already. =) We've been having lots of simple fun in the kitchen! 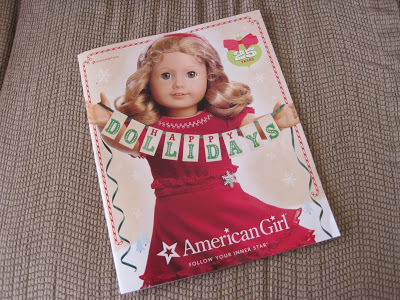 We are lucky to have the American Girl store just 30 minutes away! My daughter had her 9th and 10th birthday there.